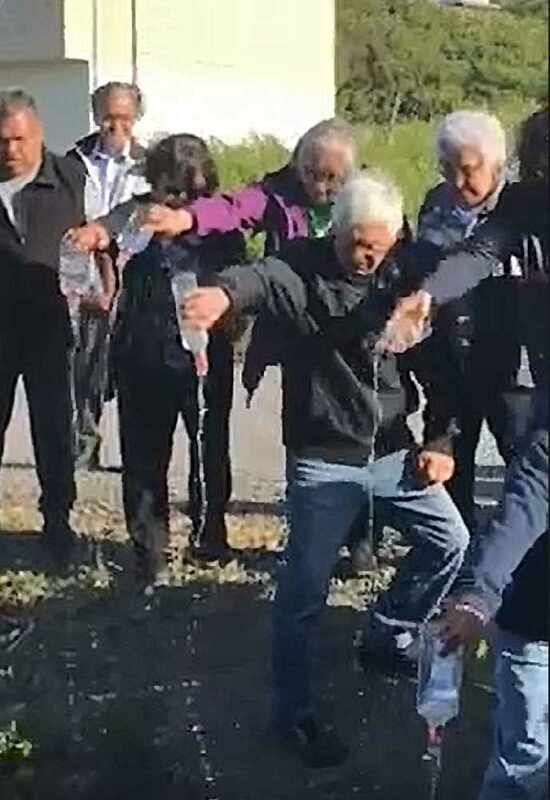 Gitxaala Elders and hereditary leadership dump bottles of alcohol after declaring zero tolerance in the community. A box of alcohol arrived on a plane in the remote community of Kitkatla, B.C. May 16. It was a day after a letter had been distributed telling residents there would be zero tolerance for alcohol and drugs in the community. Gitxaala Nation Chief Clifford White told Dustin McGladrey of CFWE-FM that hereditary leaders and community members had been meeting to plan long-term initiatives that would point the village toward “having a healthy, vibrant, holistic, successful community” and discussing what that would look like. So when the planning committee members heard of the shipment of alcohol they decided to take action and publicly dumped the 12 bottles of vodka while videoing the demonstration of their determination. “No more alcohol in Kitkatla,” they said. Kitkatla is about 45 km S.W. of Prince Rupert on the north side of Dolphin Island. There was a lot of discussion about the safety of the community and especially the children of the community. There was discussion about the damage the alcohol causes and the suicide rate. White said the alcohol is coming in from urban members for the purposes of bootlegging. The leadership doesn’t want to point fingers at individuals, because they view such activity as a cry for help. White said the dumping of the alcohol was part of the reconciliation movement, an attempt to correct the social issues that have plagued Indigenous communities because of the abuse Canada has heaped on Indigenous peoples over history through colonization, residential school, the over representation of Indigenous peoples in prisons and in the child welfare system, poverty, loss of culture and language. Drugs and alcohol misuse is a result of a broken spirit, said White. So the reaction to hearing of the alcohol shipment was not made without due consideration, he said. White said it's difficult to stop the delivery of alcohol into the community. There are planes, boats and ferries that come and go to and from the community. So, long-term plans focus on education and employment opportunities. The day after the alcohol dump, 40 or 50 community children attended the meeting of the planning group, said White. The children did a drum and dance, then they read letters that they wrote to the hereditary leadership, thanking them for thinking about the young ones and their future.